After Airtel payments Bank, now Paytm, India’s most used mobile wallet, has launched Paytm Payments Bank. Paytm had decided to launch its Payment Bank last year near Diwali but due to some reasons it wasn’t able to go ahead with the plan. Paytm, through its newly incorporated company Paytm Payments Bank Ltd has entered the Payments bank market. In India, Paytm is now the second company after Airtel, to have entered the Payments bank segment. Paytm founder, Vijay Shekhar Sharma would be the CEO of the newly formed company. With this transition from a digital wallet to a payments bank, how would it affect you, would be your prime area of concern. HimBuds.com brings for you all the details about this transition. With effect from 23rd May 2017, If you possess a Paytm wallet, it will automatically be migrated to the paytm payments bank. In case you wish to opt out, you can do so by emailing your concern to help@paytm.com. You can then transfer your wallet amount to your respective bank account. Despite the migration, you wallet account will not be converted to a bank account. Just like a normal bank, the users will have to separately open up a saving or current bank account. The login details will be same for the wallet as well as the payments bank. Paytm users can become account holders by requesting an invite for themselves by logging into their paytm account. A paytm payments bank account has an upper deposit limit of Rs. 1 lakh. They also offer other services like debit cards and interest. Interest rate of 4% will be offered to account holders. As a promotional offer, Paytm is also offering a 1 percent cash of Rs. 250 in case you transfer more than Rs. 25,000 to your payments bank account. This cashback can be redeemed for a maximum of 4 times. This account will not have any minimum balance requirement anc can remain operation with zero balance. There will be no additional charges for online transactions (IMPS, RTGS, NEFT). 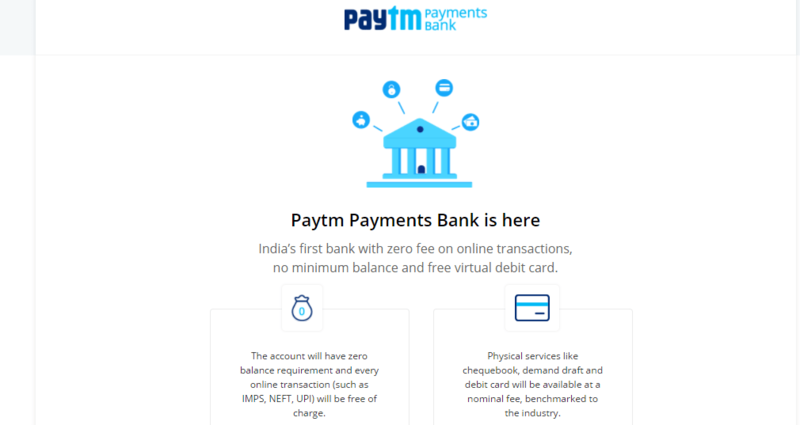 Unlike Airtel Payments bank, which does not offer physical services, Paytm Payments Bank will also offer debit cards, demand drafts & chequebooks charging a nominal fee for the same. Paytm will be offering an interest rate of 4% on the amount deposited in the account. this is much lesser than the 7.5% interest rate which Airtel is offering for deposits in its payments account. Paytm is not planning to launch its own ATMs. Though money can be withdrawn from any ATM for fives without any charges beyond which a cash withdrawal charge of Rs. 25 will be applicable. Really good, Vishal. I really like this post. Thanks a lot. Stay tuned for upcoming articles.